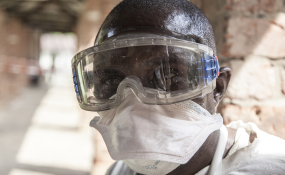 An Ebola health worker at Bikoro Hospital, Democratic Republic of the Congo (file photo). A week after declaring the end of an Ebola outbreak, the health ministry has announced a new one near the Ugandan border. Local authorities have called for "calm and prudence" in the northeastern province. The Democratic Republic of Congo (DRC) on Wednesday announced a new outbreak of the deadly Ebola virus in the North Kivu province. The announcement comes a week after Congolese authorities declared an end to a separate outbreak in the northwestern Equator Province. "At this point, there is no indication that these two epidemics, which are more than 2,500 kilometers (1,500 miles) apart, are connected," said DRC Health Minister Oly Ilunga Kalenga. Local officials in North Kivu notified the health ministry on Saturday that at least 20 people had died from hemorrhagic fever out of 26 cases in the area. The first case emerged in early July. Samples from the latest outbreak were sent to Kinshasa for analysis, with results showing four out of six cases tested positive for Ebola. North Kivu province Governor Julien Paluku called for "calm and prudence" after the announcement, saying authorities are doing their best to contain the outbreak. Local health authorities said the World Health Organization (WHO) has already deployed a team of experts to the area. The latest outbreak marks the tenth of its kind since the virus was first discovered in then-Zaire in 1976. The WHO is likely to respond quickly after it was criticized for its slow response during the 2014 outbreak in West Africa that left more than 11,000 people dead. During the last outbreak in May, the WHO deployed an experimental vaccine to contain the virus after it reached a large port city, prompting fears that it could spread quickly throughout the country. Liberia: Disco Hill Ebola Burial Site Running Out of Space?